Evergreen plants play a vital role in our overly wet winters. Because they photosynthesize all season long, they help prevent storm water runoff by taking up water all winter long – when we have the most of it. Their perpetual green and branching forms also help to disperse rainfall into smaller droplets, minimizing erosion in the landscape. Conifers and broadleaf evergreen shrubs also help define a garden and encourage wildlife in the winter. A garden would be bleak indeed without their vibrant foliage four months out of the year! The shelter of their branches supports native wildlife, including many winter songbirds like chickadees, Anna’s hummingbirds and juncos. Conifers and broadleaf evergreens come in many forms and sizes. They are easily found at local nurseries and can be viewed in their mature form at local area gardens. To get information about where to look and to talk more about proper plant choices for your site please contact us! 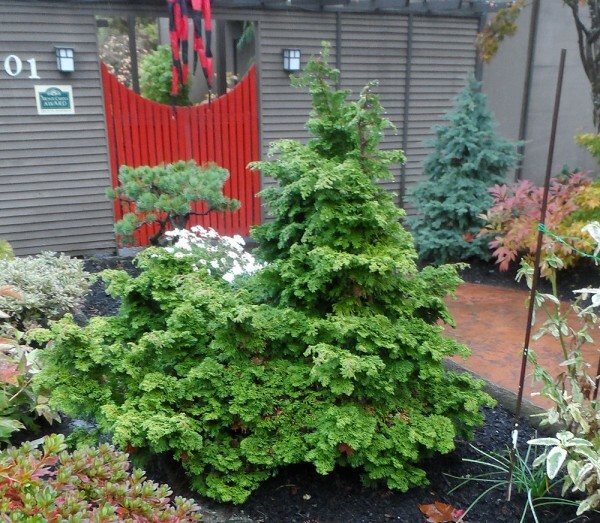 Hinoki Cypress – Chamacyparis obtusa ‘Gracillis’ – A stately, narrow tree with peeling, reddish brown bark, to 20 feet. Twisting sprays of foliage on the branch add texture and motion to the landscape. Hollywood Juniper – Juniperus chinensis ‘Kaizuka’ – Unique upright, bold habit. 15 feet tall, 10 feet wide. Another great choice for adding texture and motion with the contorted branching habit of this sturdy plant. Tanyosho Pine – Pinus densiflora ‘Umbraculifera’ – Showy cones, mounding shape and usually multi-trunks. Great silhouette plant against a sunset sky. Attracts birds. Slow growing to 15 feet. Compact Strawberry Tree – Arbutus unedo ‘Compacta’ – Lovely peeling reddish colored bark as it ages, with white bell-shaped flowers in fall and red, round, edible fruits following. Can have the current season’s flowers and ripe fruit on the plant at the same time. Grows 6-8 feet tall and 5-6 feet wide. Pacific Waxmyrtle – Myrica californic – Upright and shrubby, this native can have an open, loose habit. Black fruits appear in fall. 10-30 feet tall and wide over time. Fast growing, plan accordingly! Tasmanian Leatherwood – Eucryphia glutinosa – Large white flowers appear in summer, blooms for many weeks. Leaves take on tints of orange and red in the fall. The tree grows up to 25 feet, and can spread up to 15 feet wide. Grow in a spot sheltered from hot sun and wind. Tan Oak – Lithocarpus densiflorus – Best in rich, moist soil, can be a tree or shrub, 10-20 feet high. The acorns are oak-like but the flowers are like those of chestnuts, providing wildlife food and nesting materials. Oregon Myrtle – Umbellularia californica – Also known as California Bay Laurel. The leaves can be used like those of Laurus nobilis, the familiar bay laurel, in the kitchen. Compact habit, Oregon myrtle looks great all year long. Provides wildlife food and shelter. A large tree both in height and spread, can reach 30 feet in both directions! Plan accordingly. Can be kept pruned and the branches shared for their harvest. Spaan’s Dwarf Pine- Pinus contorta ‘Spaan’s Dwarf’ – Small scale pine that introduces the contorted, wind blown shape of larger shore pines into the small urban garden. A slow grower, it may reach 3 feet and 4 feet wide in 10 years. Plum Yew- Cephalotaxus harringtonia – Layered branching with thick evergreen needles arranged in a v pattern on the stems make this a wonderful choice for a focus plant in the garden. A good choice for shady areas, this plant requires minimal pruning and can be drought tolerant once established, though a deep watering over dry periods is needed. Grows to 6 feet tall by 6 feet wide. Golden Dwarf Hinoki Cypress – Chamacyparis obtusa ‘Nana Lutea’ – A dwarf golden Hinoki cypress that grows in a dense solid form, maturing to a pyramidal shape. Inner leaves deepen to a darker green with the newer, outer foliage remains gold and yellow for a nice contrast. Grows to 3 feet tall by 3 feet wide. Silk Tassel Bush – Garrya eliptica – A very attractive shrub, especially in winter when the almost glowing, silky white tassels appear. Attracts beneficial insects, bees, and great for bird habitat and bird food. Coffeeberry – Rhamnus californica – Red branches add interest and fruit ripens from green to red to black. The fruit is edible and sweet and also great for wildlife. Profuse flowering make this a great choice for pollinators. Can reach 15 feet high and wide in 20 years. Evergreen Huckleberry – Vaccinium ovatum – This native plant is well known to our native fauna with birds relying on the fruit in the winter. Can reach 8 feet in a shady location, but will grow well and more compact in sun. Glossy, green leaves, red new stems and leaves: a very handsome and desirable plant for the winter garden. Mexican Orange – Choisya ternata – Large, round habit, can reach 6-8 feet tall and wide but can be pruned easily. Fragrant white flowers span spring through fall if sited in full sun. Attracts bees. Easy and fast growth make this a good choice for covering ground in areas where minimal maintenance is desired, especially on a slope. Camellia ‘Yuletide’ – A familiar garden plant, this camellia blooms in late November into December. The red flowers with yellow stamens provide showy decoration when little else is blooming in the garden. This plant is attractive to hummingbirds and particularly good for Anna’s hummers, which are present in the northwest through the winter. Can reach 8-10 feet tall and wide. Easily adapted as an espalier for narrow planting areas and as a living fence. Russian Olive – Elaeagnus angustifolia – A nitrogen-fixing shrub good for breaking up clay soils. Clusters of fragrant yellow flowers in early summer, followed by edible though mealy fruit. The fruit and thorny thicket-like branches are supportive to wildlife. Silvery leaves add dimension to the garden. It looks like the perfect choice for me IF it can take full sun. I live outside of Albuquerque in the same microclimate as in town. If you have another suggestion for a smaller to dwarf selection that can take the sun please let me know. Hola! I’ve been following your site for some time now and finally got the courage to go ahead and give you a shout out from Houston Tx! Just wanted to say keep up the excellent work! Thanks so much! Hope the weather is starting to cool for you now. While we are not as challenged by the heat, we too in the northwest have been having a dry spell and warmer weather than we usually get. The rains are beginning to return and things are finally cooling off. You are welcome to contact the hotline for info! Of the above recommendations, which ones can handle our winter rains and summer droughts for those of us who have limited – almost no – ability to water from June to September? Also, would you know which ones are less deer palatable? Hello Sonia, Most native northwest plants can handle both rain in the winter and drought in the summer. To adapt them for limited watering plant in the fall so they can establish a sturdy root system before the dry weather comes along. Deer resistant plants are few and far between – they will eat most anything if they are hungry enough. they have some favorites, like fresh twigs on deciduous plants or rosebuds for instance. Try conifers, spiky plants and plant some for them to browse on that will keep them occupied and hopefully protect your desired plants. Shrubs like Willow or Red Stemmed Dogwood are good choices- they grow fast and tolerate deer browsing on them – it just makes them bushier. Hope that helps!